I'm going to be completely up front here, I stole this whole recipe from Alton Brown. Well, almost. 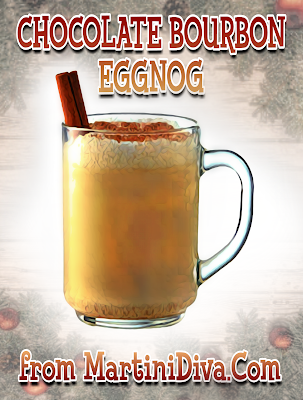 I cheated and used eggnog I bought from the store because I'm not Alton Brown. And I made it chocolate. And I used a different (and more) booze. 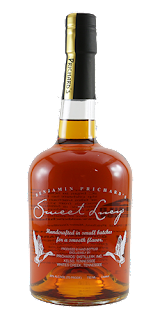 And I'm lazy and I didn't have time for homemade eggnog because a couple of friends stopped by with a bottle of what they called "bourbon" that was actually a bourbon liqueur called Sweet Lucy. I expected bourbon, I got a sweet liqueur. So I had to adjust dear Alton's recipe a wee bit. DIRECTIONS: Fill your cocktail shaker with ice and add the Sweet Lucy, Maker's Mark, the eggnog and the chocolate syrup and shake until nicely chilled. Pour into your cocktail glass and garnish with a dusting of each of the powders (dark cocoa, cardamom, nutmeg), add a cinnamon stick and serve. * Homemade Dark Chocolate Syrup Recipe: I prepared my own Dark Chocolate Syrup by taking 1/4 cup of Hershey's Special Dark Cocoa Powder and mixing it with 1/2 a cup of milk, a pinch of salt, 1/2 cup of sugar (I wanted a BITTER chocolate syrup to balance the sweet bourbon liqueur. If your want regular syrup you need to double the sugar.) and several hearty dashes of Frappe & Sons Chocolate Bitters and a few of their Coffee Bitters. I brought this all to a quick boil, immediately reduced the heat and simmered until it thickened then allowed it to cool in the fridge. Dear Alton, yes, I cheated and messed with your recipe. I'm dangerous that way.